Lowery, Mike. Very Good. Bubble in the Bathtub (Doctor Proctor's Fart Powder) by Nesbo, Jo. Trade paperback (US). Glued binding. 448 p. Doctor Proctor's Fart Powder. Intended for a juvenile audience. Lowery, Mike. Good. Bubble in the Bathtub (Doctor Proctor's Fart Powder) by Nesbo, Jo, 2011-11-15. Trade paperback (US). Glued binding. 448 p. Doctor Proctor's Fart Powder. Intended for a juvenile audience. Lowery, Mike. Very Good. 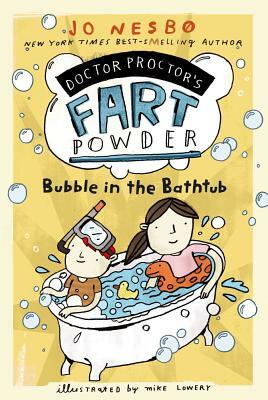 Bubble in the Bathtub (Doctor Proctor's Fart Powder) by Nesbo, Jo. Glued binding. Paper over boards. With dust jacket. 425 p. Contains: Illustrations, black & white, Line drawings, black & white. Doctor Proctor's Fart Powder. Intended for a juvenile audience. The book arrived in a prompt fashion and in the condition promised in the description.